"HR Proactive has helped us stay ahead of the curve of ever changing requirements for Health and Safety training. HR Proactive’s extensive suite of Health & Safety training programs such as Supervisor Health & Safety Awareness, WHMIS and Young Workers Safety provides us with previously unavailable fully customizable materials to meet our municipality’s needs." HR Proactive's WHMIS training program is an easy tool to help you meet your obligations to train your workers. 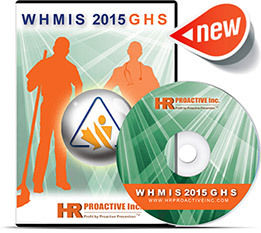 This 15-minute general WHMIS video DVD features a quiz to ensure workers understand details about hazardous materials. General WHMIS education teaches your workers about hazards, labels and MSDSs, along with their rights and responsibilities. These topics are included in this self-contained training kit for easy use. Need WHMIS and other training programs? Ask us about putting all our compliance videos on your company’s customized launch page so that your employees can access 24/7. E-Learning programs are available for many training topics and can be customized with your company’s brand/logo.